Dharma's passengers and crew had to get used to summer snow on their Antarctic trip. 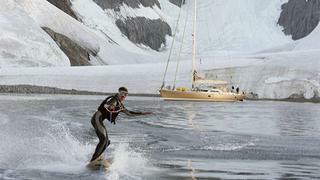 Dharma could moor within metres of glaciers, allowing guests to enjoy extreme water-skiing. After taking stock of my life, I felt the time had come for change. The question was, what would I do? The idea of a trip around the world took hold in my brain and grew, but I was unsure how to go about it. Then it came to me: I would go by boat. Luckily, as I was casting around, doing research on yachts and shipyards, I met Mario Pedol of Nauta Design in Milan. He showed me the design for the Southern Wind 95 that his studio had collaborated on with Bruce Farr. I was in love. Dharma became my first yacht. Since I was planning on living on board for at least a year I wanted a comfortable boat and I liked Nautas general plan for the yachts lines: Dharma had a modern classic deck house, plenty of sheer, low bulwarks and a fine-angled, slender bow. The central helm station left the stern wide open, creating an excellent space for everything from sunbathing to cleaning fish. It was also an ideal position for meditating and watching the world go by. 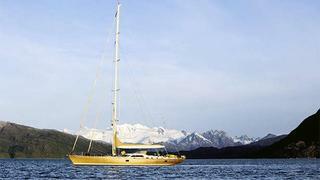 I also liked her custom hull colour  a sort of sandy gold  which gives Dharma a special elegance. I wanted a boat that would allow me to stay at sea for extended periods, as far from civilization as possible. I had 5,000 litre capacity fuel tanks installed, along with two refrigerators, three freezers, a vast pantry and well-conceived storage so that we could be self-sufficient for long periods, with Dharma only having to get to port for refuelling and minor maintenance operations. A lover of good food, I made sure the galley was the centre of things below decks, and I was to spend many happy hours cooking with Carlos, my excellent captain, who was a good friend. Once I had learned the basics I found that Dharma was easy to sail and had the performance I needed. Thanks to Farrs hull lines and appendages she clocked 10 knots close hauled in winds of about the same. And weighing about 70 tonnes, she feels light and quick at the helm. At times it was almost as if she made her own way once the sails were adjusted, travelling the world without a fixed destination. For a journey like this you need a captain and crew whom you can count on and get along with. Spending the amount of time on board that I did, I was really like another crewmember; there wasnt much difference in status between my captain and I. Finding the right people was not easy, and as with so many things it took a stroke of luck. In the first year I sailed from Cape Town to the Mediterranean, and then on to the Caribbean and back. During that time I had two changes of captains, both of whom were very competent, but not people I could imagine sailing to the Antarctic with. Then my old friend Carlos came on board. An excellent cook and a superlative sailor, we have one of those bonds that will last forever. One day when we were in Fernando di Noronha, Brazil, Carlos met a family that had chartered boats for years between the Antarctic and Patagonia. I will always remember Carlos face when he returned from a provisioning trip  he was so excited he could barely speak. Such was the faith and confidence that I had and still have in Carlos that I consented. But I really believe that if I hadnt I would have woken up one morning and found that we were on our way anyway. As I said, there really wasnt much difference in status between me and my captain.